UNITED NATIONS, Sep 28 2012 (IPS) - With the global population on track to reach a staggering nine billion people by 2050, according to U.N. figures, a stronger action plan is needed to address the challenges of ending poverty, ensuring a well-functioning health system and access to education, as well as guaranteeing social inclusion for all. 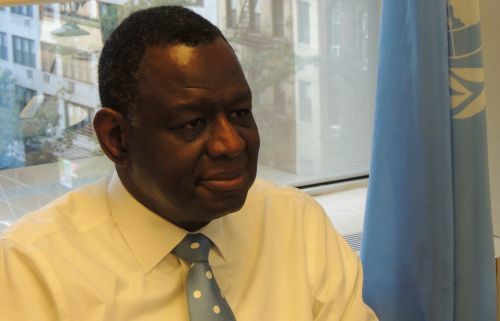 “The demographics of the world is a tapestry, it is not just about growth, but there are other issues that we need to address,” said Babatunde Osotimehin, executive director of the United Nations Population Fund (UNFPA), a U.N. flagship agency involved in advocating for human rights and gender equity, with a particular focus on youth and women. “And I would capture it by looking at what I call the continuum of life,” he added in an interview with IPS. Osotimehin pointed out that, against the backdrop of the current global economic and environmental crisis, more emphasis must be placed on issues such as ageing, access to reproductive rights and education as well as empowerment of women and youth. Speaking with IPS correspondent Malgorzata Stawecka on the launch of U.N. Secretary-General Ban Ki-moon’s global initiative ‘Education First‘ Wednesday, Osotimehin explained how United Nations member states along with UNFPA are preparing to meet the challenges of a world of nine billion. Q: What would be the major focus of UNFPA next year? Ageing? Family planning? Rising population in the developing world? A: There are two extremes which we address. First of all the young people who are at reproductive age or going to become active in their reproductive life. Given the fact that most of these young people live in the developing world, where population growth is still rapid, we as the Population Fund are working with governments to address the issues of comprehensive sexuality education, generally for girls, to make sure that we give them the enablement to attain their full potential, because we know that when girls are educated they make different choices in their lives. Reproductive health services are included in the plan and we’re working with governments to put in place policies that ensure the rights of people to make those choices without coercion. If you achieve that spectrum, you’ll actually slow population growth. And we’ll continue to do that. We’ve done that in many countries and it’s been successful. Going forward with a rights-based approach, providing education services, will be the right thing to do. Now that’s one bit of it. There’s the other bit of it where you look at it and see that the population is ageing and that countries actually are shrinking in terms of their population. Productivity might be affected because we’ll have fewer younger people than older people. Today one in nine in the world is aged above 60. But by 2050, one in five will be above 60. So, we are seeing the progression towards ageing. We must be aware of it. In trying to put in place systems and social policies we’re considering what does (ageing) mean for production, running services, employment, social policies, social services, health, housing and education. These are things that we’re involved in and these are the ways we’re engaged with the government. Q: Do you think the current global economic crisis, especially in Europe, would have a negative impact on funding population programmes worldwide? A: The current global economic crisis may affect funding for population programmes because we don’t know how long this will go forward. Some of the donors are affected at this point, but hopefully solutions will be found to the eurozone crisis and we begin to see the difference in terms of overseas development assistance. But maybe it is also the time to begin to look at development systems in a totally different lens. For example, what we’re doing with the ‘Busan agreement’ that actually involves South-South cooperation, cooperation rather than assistance in that sense, technical assistance, modalities of affecting the development process, which might not be entirely dependent on money. Finally, to also challenge new and emerging economies to begin to participate in the development agenda through south to south and just making sure that this share of experiences are across the regions and across the world. That’s probably what is going to happen. Q: The programme of action adopted at the 1994 International Conference on Population and Development (ICPD) in Cairo will commemorate its 20th anniversary in 2014. Do you expect a follow-up international conference? A: There is not going to be an international conference, but a high-level meeting at the United Nations. I think at that point we’re currently engaging, reviewing how far we’ve come in the Cairo process and by 2014 we’ll have the secretary’s general report on what we’ve already accomplished with the rights-based approach to reproductive health, but basically also to identify gaps, what are the things we need to take forward, programming wise. We’ll be able to use that to inform our agenda, but more importantly also inform the development agenda of 2015 because reproductive health and the rights of women and girls has to be front and centre for us to actually make progress. Q: What in fact are the successes and failures of ICPD? Have the funding targets for ICPD been achieved? if not, how big is the shortfall? A: Funding targets have not been achieved so far. I couldn’t tell you exactly how much it is, but we’ve made progress. As you can see, there is a great increase in female education around the world. We’ve also been able to provide comprehensive sexuality education in many countries and to improve environmental policies about reproductive health. We’ve also seen greater spending domestically by governments themselves in this area. Of course there are many challenges, like resistance to women’s issues to ensure reproductive health and rights, but I think, all in all, we’ve made great progress. Q: With the launch of ‘Education First’, Secretary-General’s Ban Ki-moon’s global Initiative on education, what role will UNFPA play? A: The role of UNFPA in this initiative is to highlight the unique perspective we’ll bring to education. A) On the current issue of girls’ education which is crucial for national development; B) to insist that education is comprehensive and to include comprehensive sexuality education; C) to also go forth to talk about empowerment of young people and provide them with the skill set to be able to participate effectively in national development. That’s what we bring. Three days ago, I said the young people are the future and I was told by young people, “No, we’re here. We’re not the future, we’re today.” And it’s true. Because the changes that happened in North Africa were by young people and that’s what happens all over the world. There are challenges for all of us, but it’s important to see how can we make sure that young people are part of the conversation and that they see themselves as a part of solution and not the problem.